Who listens to this stuff? This is MTV we're talking about, a channel that hasn't shown an actual music video in about a decade. MTV is a reality TV channel. MTV handing out video music awards now makes as much sense as the Home Shopping Network handing out Nobel Prizes. Top video winner: Miley Cyruss and her Wrecking Ball video. Wait a minute, isn't that the same wrecking ball we were all mercilessly mocking for the past year? The Internet fairly ruptured itself with memes parodying Miley. Why do we have to line up and clap for her now? In fact, you can't help but notice a huge disconnect between the artists honored at MTV and the groups people actually listen to. 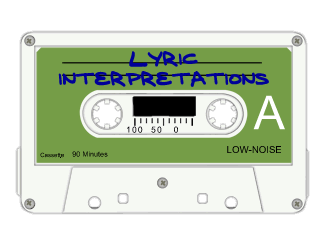 On the whole winner's list, not one of them shows up in our current trending artists list here at Lyric Interpretations. Of our trending artists list, only Taylor Swift shows up on the page about MTV at all; she performed, but was not honored. What do people actually listen to? Now, speaking as a parent of teenagers, I get to be pretty plugged in to what young people are listening to. Which is why I'm increasingly alarmed year after year to find them refusing to move on to their generation and clinging to mine instead. Wait, sixteen-year-olds are now more into Kurt Cobain than they are modern top-40 radio? Because Kurt Cobain has been dead since before they were born. When a dead guy from 20 years back can connect with the kids of today more than a real live person right now, that's telling you how out of touch the whole top-40 and award scene is. And if we shift our focus outside the mall with kids raiding grandpa's album shelf, we'll find older generations listening to the same thing. And then after that, we turn to the Internet. What do people pretend to listen to? There is another class of music popular with a lot of people but either too obscure to find on a T-shirt that wasn't custom-printed, or just too niche to be appreciated by more than a select group. Now we're in heady college intellectual territory, with Bob Dylan, Frank Zappa (peace be upon the name of the prophet), Pulp, Cake, Neutral Milk Hotel, Television, Talking Heads, They Might Be Giants, Destroy All Monsters. You might dismiss some of these as "geek music," but don't look now, but we're all geeks. Internet culture is actually more relevant than radio now, I'd say. And then there's the hipster factor. That's where you find Doors, Beatles, Velvet Underground, Parliament, Radiohead, Fugazi, Primus, Weezer, Dr. Dre... all on the same playlist. People who pick their music based on what will be good for them more than what they actually can rock out to. Don't get us wrong, we love all this stuff too! The ultimate irony of hipster culture is that it will have good taste, even if it's defiant taste, and what they think is popular will eventually be shared alike with non-hipsters. Beyond that, we reach the gateway of Internet infinity. There are thousands and thousands of bands out there, with thousands of fans, and you've never heard of them. Neither have we, and we're a music website. Indy / arthouse / alternative artists, some of them going no farther than to record in their garage and mix in the bedroom on a laptop, now have more of a following than Frank Sinatra had in his day. This is because the Internet is a world-wide audience. You can have twice a Sinatra worth of fans, and still be obscure, unknown, and broke. So who are these people who actually like top-40 music? Oh, don't get us wrong. There's still fans out there for Eminem and Kanye West. But by and large, when queried about Kanye, most people will respond "Yes, I've heard of him." Not "Yeah, I have all his albums, he rocks!" Just "Kanye, oh, that jerk that married Kim Kardashian." We all know who these people are, but most of them aren't the same names on your iPod playlist. Most of them are merely famous for being famous. The fact is, TMZ and Perez Hilton and the whole MTV world, lives in its own record industry bubble. That bubble is almost a secret underground society all its own. Rihanna, a great artist who's sold a lot of records and swept a lot of Grammys. And barely peeks into the bottom rungs of Grooveshark's popular playlist. Who's on top of Grooveshark? Currently Maroon 5, Sla, Nico and Vinz, One Republic, and American Authors. I'll tell you this much, more people listened to music on Grooveshark this year than listened to music on MTV. Good luck making sense of that.